New regulations on burials and cremations prompted by the baby ashes scandal have been agreed by MSPs. The Burial and Cremation (Scotland) Bill requires councils to retain details of services, as well as creating a legal definition of ashes. MSPs unanimously backed the bill, saying it was vital the scandals should never be repeated. The legislation was prompted by Lord Bonomy's probe into the disposal of baby ashes at Scottish crematoriums. The review was sparked after it emerged that staff at Mortonhall crematorium in Edinburgh had secretly buried the ashes of babies without their parents knowledge for decades. More than 250 families were told that no ashes were left when young babies were cremated, and further cases were reported in Aberdeen, Fife and Glasgow. There had been fears the legislation lacked "detail and ambition", and calls for a licensing scheme for undertakers, but MSPs from across the chamber voiced support for the amended bill. There was also debate over a measure which would have barred houses and crematoriums from being built within 200m (656ft) of each other. This was removed from the bill after it was agreed local authorities should be trusted to make these decisions on a local level. Moving the bill, Public Health Minister Maureen Watt said it would bring about important improvements to the system and prevent further scandals. She said: "It is really important to prevent a repeat of previous mistakes, and I believe the bill will achieve that." Labour's Jenny Marra welcomed the bill, saying it would increase the "dignity" surrounding burial and cremation. She particularly welcomed the amendments, and said it was "just a start" on efforts to tackle funeral poverty. 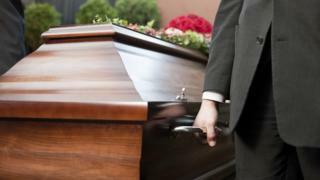 She said: "It is a hallmark of our civilised society that can afford everyone a dignified funeral, burial or cremation." Fellow Labour MSP Malcolm Chisholm said parliament was united in thinking mothers should be at the centre of the decision-making process when they lose a child during pregnancy. Conservative Nanette Milne, making her valedictory speech in the chamber, said: "This is a very welcome piece of legislation, and much needed." She added that the bill should "prevent in the future the traumas of the many parents" who still have no idea what happened to their babies' ashes.